Listing creation and optimization is a process that is often overlooked by private label sellers. It’s very easy to find listings on Amazon that have little or no content and are poorly optimized. This may be fine if you are a large brand where people are constantly searching for your brand or product but for PL sellers it is not. In this post I am going to cover the subject of Listing Creation and Optimization. In a similar way in which we do keyword research, we begin with an in-depth analysis of our competition. Now while we certainly don’t want to copy our competition we do take a close look at what they are doing well and what they are doing not so well. We start with a search on Amazon for the main keyword. We then open up the top 15 listings in separate tabs in your browser. We also have a Google sheet open where we take notes that will later be used to craft our own title and bullet points. As we go through each listing we take note of the features and benefits that are been shown by each product. If the features are also the same as the features of our product it goes into our list. Now I am not sure if “intermeshed nylon” is even an actual thing but you get the idea here. By studying the language of the market we are able to better craft our offer with language to attract them. Through this research we should end up with many features and benefits that relate to our product. We then use these to create our own title, bullet points and description. At this stage its important to mention certain fundamentals of copywriting and writing anything that is designed to sell something be it a product or a service. There is a distinct difference between features and benefits and people will rarely if ever buy on the features, they instead buy on the benefits. A feature is something your product or service has or is. For example an electric razor with close fitting heads and ultra sharp blades. The benefits on the other hand are the outcomes or results of using your product. So in the case of the electric razor that might be, extremely close shave with no skin irritation. 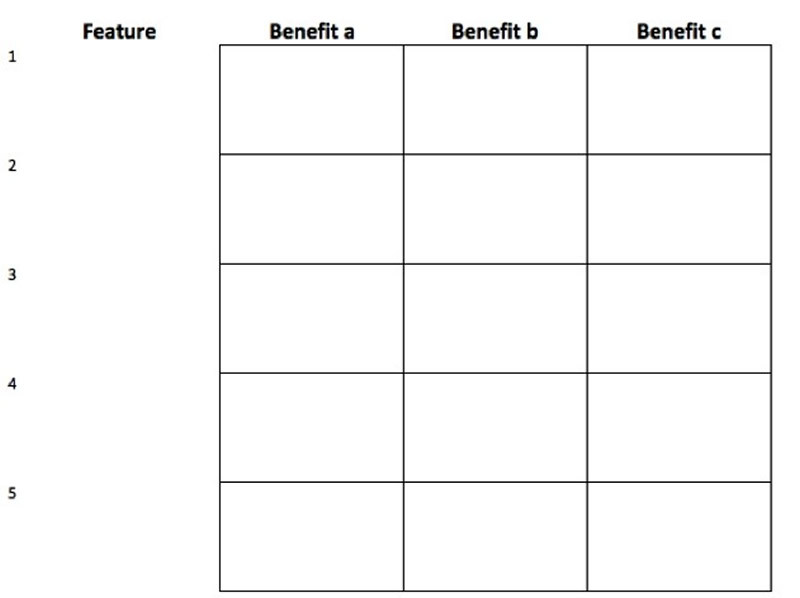 We like to use something similar to a feature – benefit matrix as shown below. We use this matrix to list various features together with their corresponding benefits. These can then be used together to form Feature – Benefit statements that we can use in our listing. Now I won’t go into the exact way that we do this as its somewhat of an art but you will be able to find many examples of how others do this from some of the best copywriters that have information on the Internet. I have personally studied with some of the best teachers for this such Jay Abraham, Frank Kern, Terry Dean etc. but you can find lots of free resources that will cover this subject in detail. When it comes to crafting your title you may find that you are restricted on the number of characters you can use by Amazon depending on what category you are in. But Amazon is slowly rolling out these restrictions to all categories so we recommend keeping it relatively short and in the following format. We then use five of the best Feature – Benefit statements we have written and use these for the bullets points and the remaining material is used in the product description. Once a draft of the listing is complete with go back to our trusty suite of tools Helium 10 (Helium 10) and we use their tool called scribbles. This enables us to add our title, bullets and description and compare it to the list of single words with uncovered during keyword research. We take note of the words not yet used and try to weave them into the bullets if we can and if not the description. We must remember that we want our listing to read well and not just be stuffed with keywords. We keep doing this until all our single words are used in the listing. At this point we can actually create the listing in Amazon. You will notice that I have not addressed the matter of images but I feel that probably deserves a dedicated post, so please look out for that. Now the listing is live on Amazon we then need to check to make sure that we are being indexed for all of the words in our single word list. This can be done manually by searching for the following in the Amazon search bar, ASIN + Keyword. If your product shows in the search results then you know you are indexed for that word. Of course this is a very slow and laborious process, so we use yet another tool from the helium 10 suite (Helium 10) called the 5K checker. With this tool we can simply enter our ASIN and our list of single words and check to see if they are all indexed in one go (a massive time saver). If some words are not indexed we will then try moving them around a little in the listing or perhaps try also including them in the backend search terms. The goal here is to make sure your listing is indexed for all your major keywords. AmzAccess offers a professional Listing Creation or Optimisation Package at a very reasonable cost. If you would like to make sure you get off to the very best start with your listing, you need your listing written professionally for high conversions and sales! Combine this with our Keyword Research Service and your product will get the best possible start on Amazon. – Click here for more details.